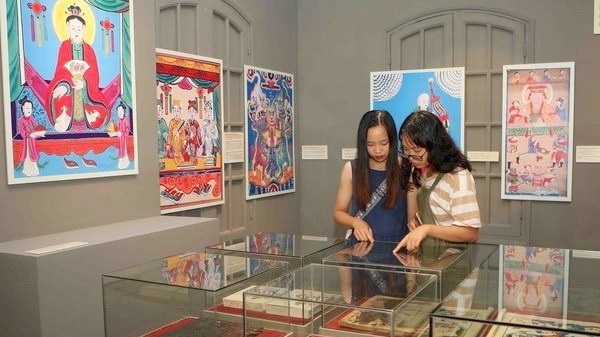 An exhibition showcasing 50 Vietnamese folk paintings opened at the Imperial Citadel of Thang Long in Hanoi on August 29, as an event to celebrate Vietnam’s National Day (September 2). The exhibits are taken from the “Vietnamese Folk Paintings” book by French linguist Maurice Durand. The book was published and is preserved at the French Academy of the Far East (EFEO). Visitors attending the two-day exhibition can also learn how to make the folk paintings. A meeting with historical witnesses was held in Hoa Lo prison in Hanoi by the High Command of Guard Police, the city’s Department of Culture, Sports and Tourism, and the Hoa Lo prison’s management board on the same day. Participants at the event recalled their memories of the fierce days of wartime in the past, as well as the spirit of comradeship and the contributions of those who devoted their lives to the national revolutionary cause. The event also featured songs and dances praising the Party, President Ho Chi Minh, and the Vietnam People’s Police Force.